Music has always been an integral part of my writing process, whether it’s selecting music to listen to while working, or choosing pieces to specifically reference in the book. 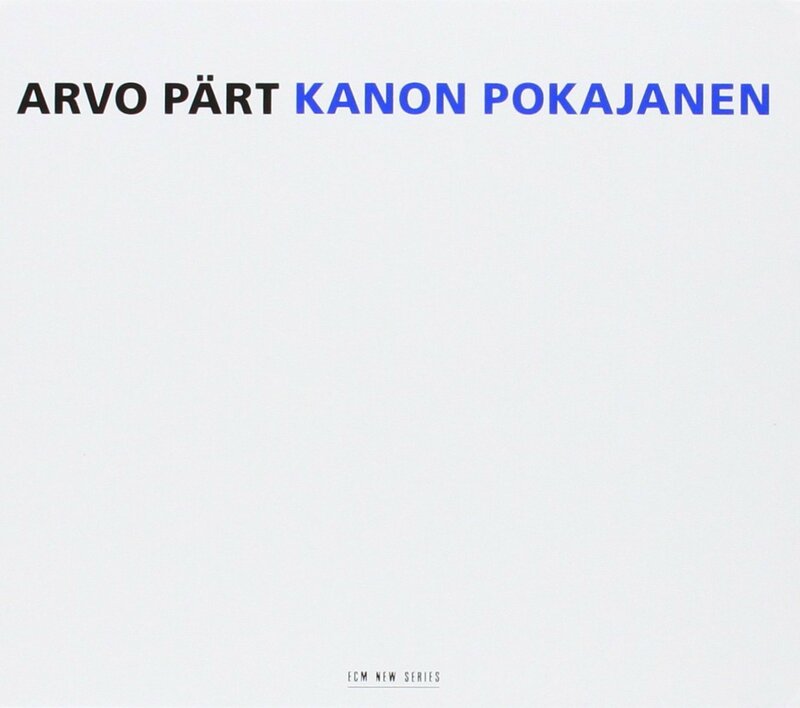 Surreality actually depicts several musical pieces including a Massive Attack song for one of Ms. Klein’s performances, but my personal favorite is the choral piece that Keenan hears at the Palace Theater, Arvo Pärt’s Kanon Pokajanen. The Kanon is a modern classical masterpiece, but its origins lie in centuries old tradition. The text is taken from the Eastern Orthodox Canon which consists of nine odes centered around repentance (thanks Wikipedia). The second ode, Moses’ rebuke of the Israelites, is often omitted from recitations and is not present in Pärt’s composition (a fact my characters discuss in context with the events of the book). My first encounter with the work was accidental. I didn’t even learn to pronounce Pärt’s name correctly for many years. It’s ‘Pear+t’ like the fruit plus a ‘T’, not ‘part’ like the widget, or ‘par’ which incorrectly assumes that the ‘T’ is silent. A two-disc copy of the CD was in the library book sale when I worked there my senior year of high-school. I had no idea what the CD was, and it smelled heavily of cigarettes, but for a dollar I sated my curiosity. The first nine seconds of the disc are silent, and I remembering wondering if there was something wrong with it. I probably turned my boom-box (yes I was still using one of those in the early 2000’s) to its maximum setting, only to met with the full blast of an SATB chorus a few moments later. Pärt’s style is very spare, borrowing a lot from Gregorian chant, and mixing one or two of the parts together in different combinations. Large sections are sung in recitative fashion (meaning one part sings and another repeats). It’s ethereal and reflective. 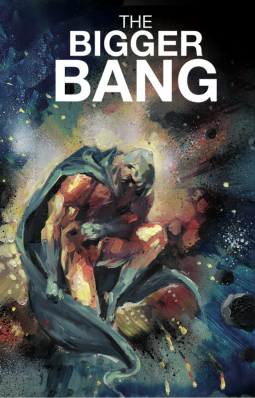 The piece gets your attention, retreats to the heavens, builds to an midway climax, then lets you go gently. Pärt uses silence to set tone. The initial silence emphasizes the contrast of the entrance, and further silences throughout allow the notes to fill the cathedral space in which it was recorded. I’ve sung in old churches only a few times, the most memorable being a trip to San Francisco in 2004. Notes can carry on for seconds, long after the people have stopped singing. It’s a particular treat to study how harmonies blend and produce all the overtones and magical things that can happen when voices come together perfectly. It’s spiritual, not just to listen to, but to experience when singing. My character’s not as fascinated by choral music as I am, but I hope that the moment is a nice space to reflect on what’s happened in the book so far, and what’s coming next. It’s still one of my favorite scenes to read, and has been present in the book in one form or another since the first draft (though Pärt’s specific selection came later I think). My latest book, Surreality, is available on Amazon and Smashwords or wherever eBooks are sold. With XMplay who needs iTunes? I’m a simple guy when it comes to music. I want a music player that stays out of my way, doesn’t try to sell me something and doesn’t take up a lot of my desktop. I want it to be able to play any music format I come across whether it’s MP3’s, FLAC’s, APE’s or game music files and convert them into something more useful. And I want this music player to be portable, able to be stored on a flash drive or even a floppy disk, never ask me for updates and be easy to install and customize. XMplay is all this and then some. Windows Media Player, iTunes and even the Amazon Music Player want to make a music library for you. They want to scan your hard drive, find all your music files, and report that information back to the mother-ship. They want to sell you new tracks, download tons of background files, and be constantly running in the background even when you don’t need them. They take up 100’s of megabytes of hard-disk space and infiltrate deep into your registry. They are difficult to customize, extend, or get rid of when you don’t want them anymore. Music playback should be simple and ubiquitous, while still being powerful. XMplay is easy to install, just download the ZIP file and extract it on your hard drive. The default installation with base plug-ins is 433 KB. For those of you who haven’t seen the kilobyte size in a while that’s about an eighth the size of your average photo from a halfway decent camera. Or about one two-hundredth the size of iTunes. 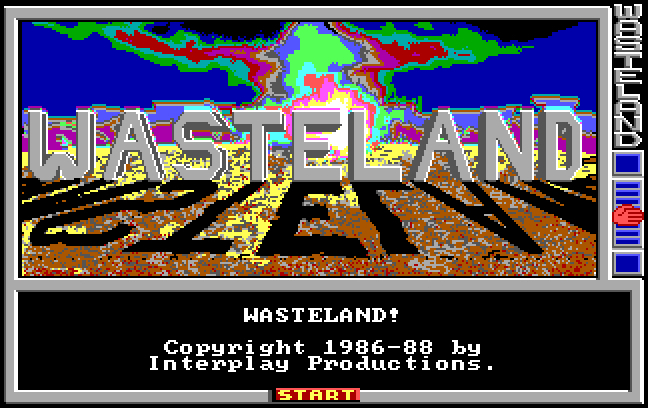 The base installation plays MP3, OGG, WAV, CD-Audio and about a dozen more audio formats. 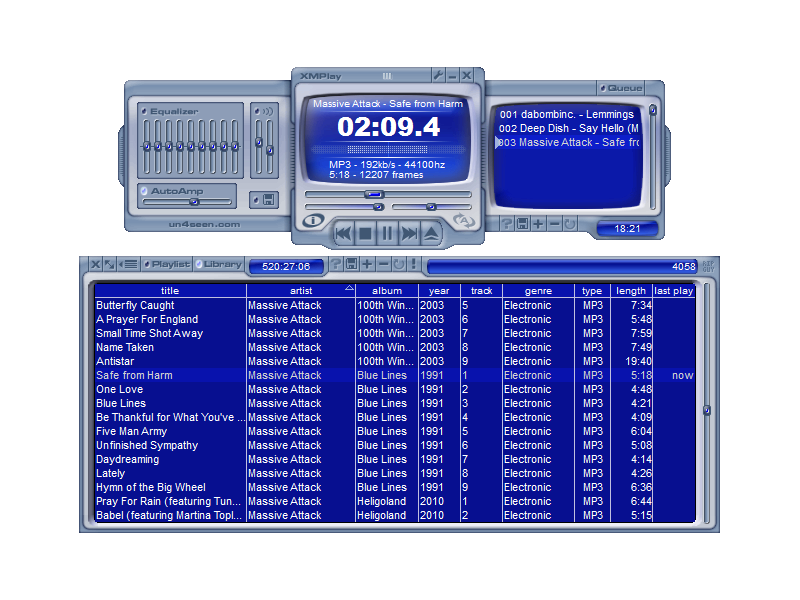 Before XMplay I used Winamp, and the skinning community on the XMplay site has skins that emulate the appearance of the common Winamp versions. All you have to do is download the skin, and extract it in the same folder as XMplay. When you start up XMplay right-click on the player and select the ‘Skin’ menu to change the appearance of the player to any of the installed skins. There are dozens to choose from and you can even download tools to create your own. Some skins have compact modes which can be toggled by double-clicking on the player. With the playlist hidden you can control playback with just the bottom bar. Additional audio formats like MIDI (common to composer programs like MuseScore and Finale SongWriter), FLAC (a lossless high quality audio format), APE (the music format for monkeys) and Shorten (SHN, used for old concert files can be added) can be added with plugins. 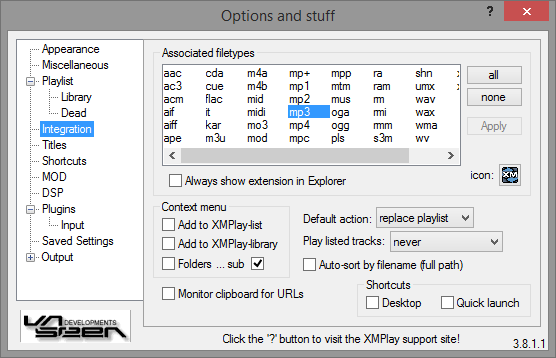 In addition to its own set of audio plugins, XMplay supports many plugins for Winamp like SHN. Again installation is as simple as downloading the plugin from the XMplay site and extracting it in the XMplay folder. MIDI – Oldy but a goody and be used to convert some older game sound files to music you can burn. FLAC – A lot of game bundles offer both MP3 and FLAC downloads. FLAC is high quality compressed but lossless audio and for real audio aficionados offers a better sound than MP3. RealAudio – Again some older files, but I bet you have some hiding on one of your old computers, and now you can play it again without having to dig up the old RealPlayer software. Apple Lossless – A lot of common Apple formats covered here. AAC Plugin – AAC/MP4 playing audio from common video formats. With all of this installed, and maybe a couple of skins and additional plugins, we’re still clocking in at under 2MB. And the best part is if you get a configuration you like you can take that folder, copy it to a flash drive, and take it to any computer you connect to. Throw a compilation of your favorite music on the drive as well and you are set for life. Here’s all I’m saying. We all are used to the name brand software, just like with a lot of other things. We don’t investigate and make other choices because this is just what everyone does. How else do you explain how Internet Explorer has been one of the dominant browsers (at least until Chrome) for all these years? But with minimal effort you can get something that is actually better, and will stay out of your way so you can listen to music rather than manage it. I am always looking for the perfect album. Music permeates my every creative activity throughout the day, as well as more mundane moments like my drive home. Some people use music to help them keep a pace while running, and I feel like I use it in much the same way. Music can help me focus by cutting out other distractions, and can help me to establish a tone or rhythm to my writing. It can even affect the pace of my typing, either forcing me to pause and reflect for a moment, or tap the keys with a mad flourish like a concert pianist (speaking as one with no piano playing ability). Sometimes I construct playlists but this is not always effective in establishing a consistent rhythm. Too many shifts in style, even subtle ones, can take me out of the work and force me to pull my focus back in. Obviously lyrics when writing can be distracting, even for songs I know very well, though for a while I was using Adele’s Skyfall to tell me it was time to pack up the laptop. Ambient music is okay, but if it’s little more than shifting waves it can put me to sleep, at a time I’m naturally inclined to do so. I kinda need a beat to keep me going. I think I’ve commented on my theory that techno music is the perfect music to program by, and it serves me in my writing often as well. Many good video game soundtracks fit into this category as well, especially the less “symphonic” scores. I like albums not only because I don’t have to spend time putting a playlist together, but also because a good album retains a thematic consistency while keeping enough variety to keep my brain stimulated. And 70 minutes is my optimal writing session, both because it’s about how much time I have before work to write at Starbucks, but also because it gives me enough time to gear up and get going, and to pause and think without feeling rushed, while not cutting too much into my day or sleep. During the writing of the fractal book one of my soundtrack staples was Indie Game: The Movie. It clocks in right at the 70 minute mark and since the score is to a movie that follows the creative process, it can throw my brain into that mode within minutes. Another more recent discovery is Bastion. I particularly appreciate how individual themes are sung, and then blended in the final tracks. What about you? What music do you listen to while you work? Or do you work in silence? What is that like?